Send this lovely combination of Fresh Baked Delicious Black Forest Cake from Taj/5 Star Bakery with Beautiful Mixed Roses to charm your special ones. This 1 Kg. 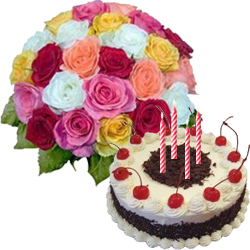 Black Forest Cake from Taj / 5 Star Bakery with 24 Mixed Roses with Burning Candles is hand delivered to ensure freshness.